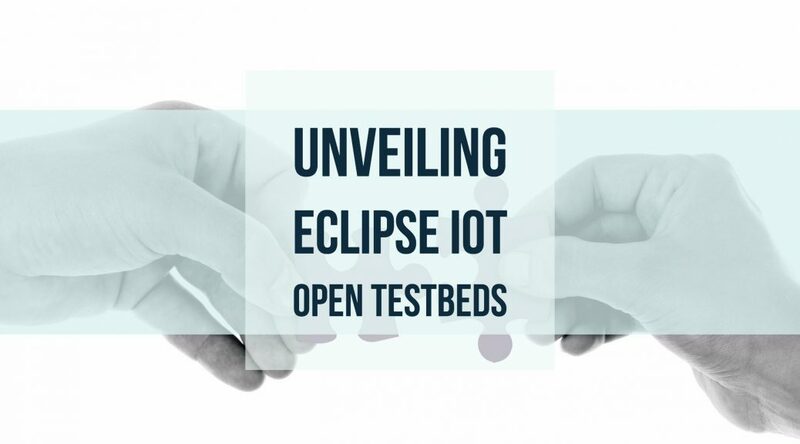 Today we are announcing the Eclipse IoT Open Testbeds, a new initiative for driving adoption of open source and open standards in the industry. For more than five years, over 30 open source projects have been calling Eclipse IoT home. Yet, it doesn’t necessarily make it easy for people to understand how to put all the pieces together, from integration with sensors and hardware, to networking and connectivity, to cloud computing and enterprise integration. More often than not, I am asked about where to find blueprints or reference architectures for IoT, and how one is expected to leverage open source software such as what Eclipse IoT has to offer. These are very legitimate questions as building any IoT solution requires much more than just open source software components. I believe the Eclipse Open IoT Testbeds are a unique approach to answering these kind of questions, especially since this is the first time IoT leading companies are effectively developing the testbeds in open source. Creating testbeds that demonstrate how a particular set of technologies can be used is certainly not a new idea, I’ll give you that. What is unique with the approach we are taking, though, is that we are making the testbeds available in open source. This means that you can really learn firsthand how all the pieces of an IoT solution are being put together to solve a real business case, as well as experiment with the actual code and dive into the architecture. Over time I certainly expect people will start forking the testbeds’ code to create their own extensions and, even better, will contribute them back to the community. The first testbed we have been working on is around Asset Tracking Management. In a nutshell, we are showing how to track valuable assets (think expensive/valuable parcels such as artwork) in real-time in order to optimize their transport, and in particular minimize the costs due to spoilage, damage or delays. The testbed features Eclipse open source projects such as Eclipse Kura, Eclipse Kapua, Eclipse Paho or Eclipse Che, but is of course also leveraging other technologies and commercial offerings – like any solution should, right? Head over to the Asset Tracking testbed webpage to learn how, to name a few, OpenShift, Zulu Embedded, Samsung ARTIK, and more, have been integrated to demonstrate a full end-to-end IoT solution, all the way from data collection to complex event processing, to exposing information to 3rd parties through open APIs. The Asset Tracking Open Testbed is our first take at demonstrating how companies are building real IoT Solutions today. We are already planning to create other testbeds around e.g Smart Manufacturing, and therefore are inviting anyone interested in existing or future testbeds to join us at https://iot.eclipse.org/testbeds. 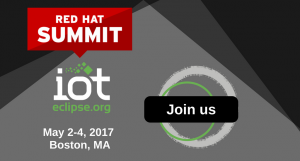 Join us at Red Hat Summit and IoT World 2017! If you are attending Red Hat Summit (May 2-4, Boston) or IoT World 2017 (May 16-18, Santa Clara), please make sure to stop by our Asset Tracking Testbed Demo, see it run live, and understand better the contribution each partner has been making to the testbed.